By Suza Francina. Many seniors are searching for ways to improve their quality of life and remain active as they enter midlife and later years. Nationwide, people are recognizing yoga for its ability to slow down and reverse the aging process. A complete health system, yoga not only restores vitality to the body, but also expands the mind and soul. 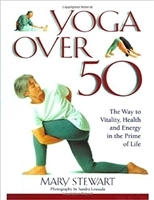 Yoga transforms the years after 50 from a time of deterioration to one of increased perspective and illumination. Ten minutes a day can transform your life! Whether you're looking for an alternative to more strenuous exercise, or a gentle yet efficient way to stay fit, Yoga Over 50 will enable you to reach new levels of physical vitality and mental clarity. by Suza Francina. A step-by-step guide for the millions of baby boomers who want one simple practice for feeling and looking great—yoga! One in five Americans is now moving toward the age bracket of "sixty and beyond," and while many are calling sixty the "new forty," this milestone is the perfect time to take stock in good health. One form of exercise that is proven to prevent or alleviate a host of physical and mental ailments for the last 5,000 years is yoga. A fully revised and updated edition of the classic yoga book, with a new foreword by B.K.S. Iyengar. 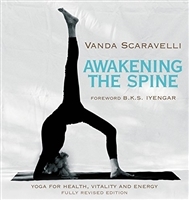 For more than twenty-five years, until her death at ninety-one, Vanda Scaravelli helped transform bodies and lives with her innovative approach to yoga through the proper alignment of the spine. She listened to the body and worked with—instead of against—it. She used gravity, grounding, and breathing to achieve dramatic improvements in health and wellbeing.